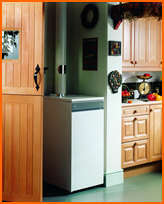 The high specification central heating boiler offers a range of sizes to suit every home. Smaller freestanding independent boilers are designed to provide domestic hot water and enough central heating for a small house or cottage, while larger models will provide domestic hot water and central heating for large properties. Gravity Feed Boilers incorporate a large hopper above the firebox, which can hold, depending on demand, several days supply of small sized Anthracite fuel. The fuel descends on to the fire, fed as required, and an inbuilt thermostatically controlled fan assists combustion, providing a quick response to demand. Gravity feed boilers are available in a wide range of outputs and sizes. Batch Feed Boilers are ‘hand fired’ and therefore require more frequent refueling than the gravity feed boilers. Many batch feed boilers are designed to burn logs. Wood Pellet & Wood Chip Boilers are fully automatic, designed to burn wood pellets or dried chips and are mechanically fed and have thermostatically controlled combustion. The largest output units are ideal for bigger properties where fuel storage can be accommodated. Your local HETAS engineer can advise you of the most suitable and cost effective option. For more information on solid fuel boilers and stockists, visit the websites of leading manufacturers on our Links page or telephone our local call rate Helpline 01773 835400.